I’ve just come across another ridiculous pricing rip off for us European customers, made even worse by the current exchange rate. Generally I’m very happy to use Open Office – the open source (free!) alternative to Microsoft Office. However a lot of our clients use Microsoft Office as it still holds on to the defacto standard status for businesses. Generally we can comfortably use Open Office to read MS Word documents etc, but sometimes there are slight formatting differences, and in some cases these differences are not entirely acceptable. For the last while I’ve been managing to run a 25 use trial version of MS Office (it’s amazing how long this 25 use version has lasted as I always made sure to just leave it running in the background). However, today I finally used up my last use and MS Office has now switched into “limited use” mode, meaning I can’t edit, save, or, well, change anything. So I went looking up the pricing of Office Small Business and was pleased to see that it only came to $299.95, and this package included Excel, Powerpoint, Word, Outlook, Publisher, and Accounting Express. 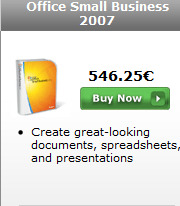 This seems like a reasonable price, especially when you convert to the euro price (approximately €200). I then noticed that this was, of course, a US exclusive pricing so I went looking for their Irish website. You’re Irish? Better screw you so! So yeah, what can I say, want to buy this in Ireland. €200?! No way, we’ve got to charge you more than that, for some unknown reason. So, €546.25, that’s a 273% markup on the US version pricing!! How can this possibly be justified? Are they charging us for their anti-trust losses? Is it just because they can get away with it and no one is complaining? I was considering purchasing this but for €546 there’s not a hope. Instead I’ll install the trial version on my laptop and get 25 uses from that, then install it on another desktop and then another laptop. I’ll run it free as long as I can. Eventually I’ll probably need to reinstall my desktop and I’ll get another 25 uses from it there.